Ben Keath is having the busiest Mental Health Week of his life. For all the right reasons. La Trobe had an hour of opportunity to catch up with the 2014 public health promotion graduate this week, in between a super busy schedule. “I’ve taken four workshops this week already, I’ve got another two tomorrow and tonight I’m doing a presentation at the Eaglehawk Rotary Club,” he says, barely breathing. But he wouldn’t have it any other way. 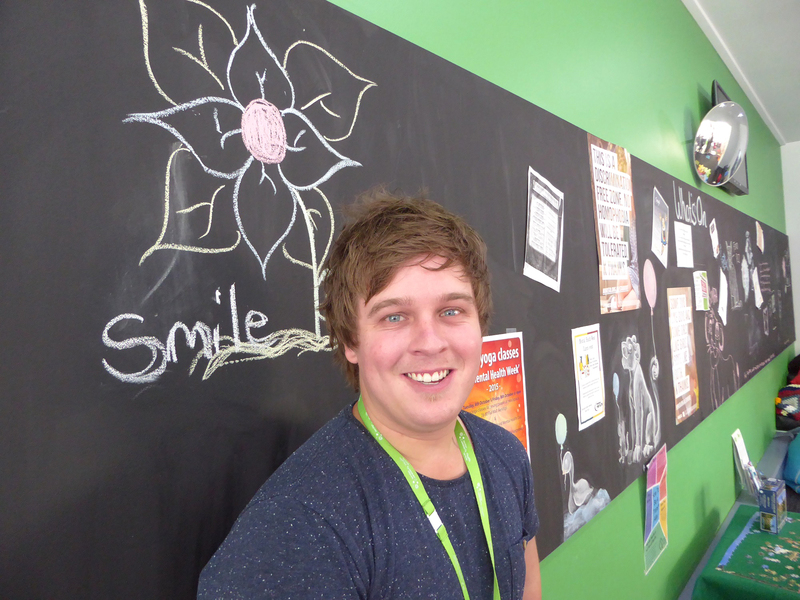 Ben started working at Headspace in April as a community engagement worker. Headspace provides early intervention mental health services to 12-25 year olds. “It’s a ripper place to work,” Ben says, worrying he may have peaked early in the job stakes. Part of his role is to go into local schools and talk to teens about mental health. This morning’s usual 45-minute session went for one-and-a-half hours. 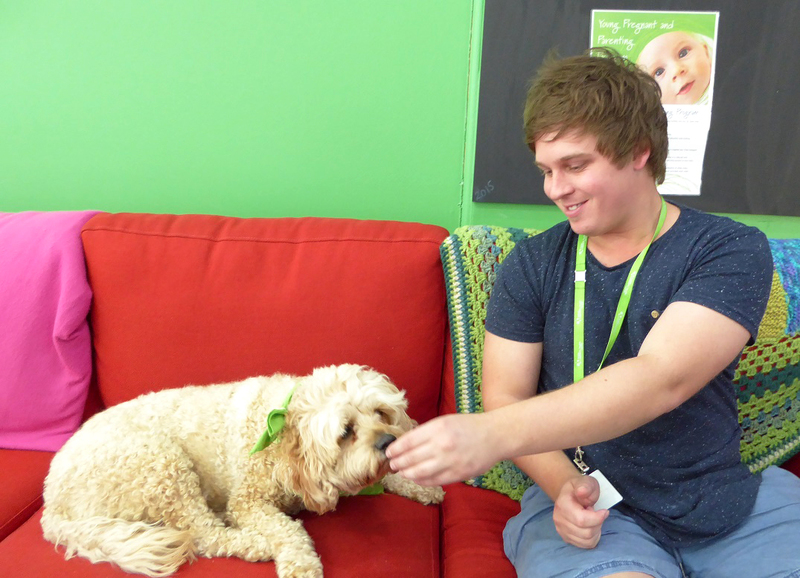 Headspace therapy dog Hully and Ben. “The last session was great, the students had a lot of questions,” he says. “Most of the time they’re questions about noticing that a friend or younger sibling needs help, and what should they do? He says while the La Trobe course covered health issues such as cardio vascular disease and cancer, it also taught him about mental health. Ben says local teens are interested and engaged in issues around mental health. He says places like Headspace, bright and welcoming along Bendigo’s main street in the CBD, are helping break down the stigmas. “This generation – and this is my personal opinion – is the most accepting generation for anything; sexual diversity, different ethnicities, and mental health as well,” he says. “I don’t know if it’s because of increased education, or if it’s a societal change, but it’s really good. Ben also coordinates a youth reference group, made up of volunteers aged 12-25, who have an input into almost everything the service does, from choosing promotional posters and where they should go, to helping design the new space along Pall Mall. “Headspace is really big on youth participation, it’s the key to everything we do.” At 22, Ben is right on demographic. He says that helps him build rapport with the young people he works with. He is using his skills to help his own generation. At first, Ben was seeking a traditional health promotion job, but he says any vacancy called for experience. “The ad for this job popped up in the Bendigo Advertiser,” he says. “It’s not something I’d thought of doing when I finished the degree. “My advice to people studying public health is to think outside the box when going for a job. Look at the skills you’ve got. Most of us are good at public speaking, at researching, writing and analysing things. Look for positions that call on those skills.